Fielding Tree Services produce firewood as a by-product of the timber brought back to the yard. It is seasoned, cut and split into manageable logs, ideal for wood burning stoves in homes or for businesses. The firewood is sold loose for bulk delivery by tipper van. Firewood is available for either collection or delivery. Woodchip is produced as a by product during Fielding Tree Service's day-to-day tree surgery and site clearance operations. Woodchip mulch is not stored by us but may be available at the end of a contract. 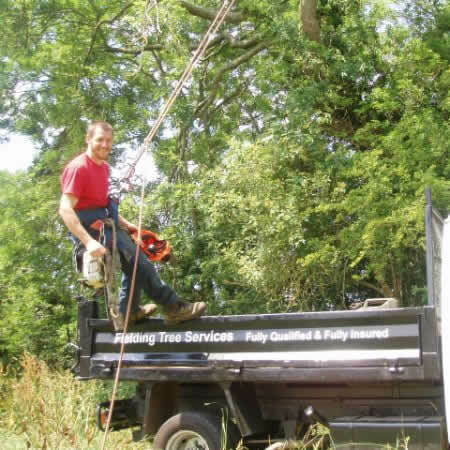 Fielding Tree Services carry a wide range of timber including oak etc etc in a range of sizes. Timber can be bought in lengths for conversion off site or we can arrange for a portable sawmill to come to the yard to convert timber into manageable sections.